It’s common to think ‘oh I should just quit eating and I will lose weight’. That’s what we are taught even at a young age and grown up to know. If you want to lose weight, you eat like a rabbit and drop weight at the snap of a finger. But is it really all that simple? Are our bodies that easy to handle? And is this good for our bodies? We are built and made to eat. And not just pecking at lettuce. Carbs are meant to be our fuel and we are to get nutrients from produce. The food that comes from the earth-not a factory or a box-is great for us, with so many benefits and vitamins to help our bodies function. And we think if we stop eating completely, this is a healthy way to lose weight. WHAT IF I TOLD YOU THIS WAS BOGUS. We are meant to eat, often and abundantly. Your body even tells you when it’s hungry and when it is not. Listen to it. If you are starving, you better eat more than a cube of cheese (cough cough, any Devil Wears Prada fans). I laugh everytime I think of this girl. But as I laugh, I know there are so many people out there who really do live and think like this. Do you know what is really happening? The body is holding on to what little food it does get, and storing it as fat and eating away at muscle and all sorts of terrible things. This isn’t what we are meant to live like. This is not the answer to losing weight. If you are hungry, you should probably eat. And not just some lettuce. Try a protein bar. Try a rice cake and peanut butter. Have an apple AND a banana. A cube of cheese is not going to feed you, and the fact that this girl binges on rolls in the hospital after getting hit with a car kind of proves that this starvation diet will eventually in a carb overload-sooner or later. Because your body and your mind craves, no needs, carbs. It’s our fuel. Everything has carbs in it. It’s our gas to our engine. It makes us run. It keeps us going. Even your brain feeds off of carbs to work properly. By not feeding your body, you are do much more damage than good. If you have been living like this and believing the starving diets are the only way to ‘skinny’, you not only will need to rethink everything, but you will have to literally reverse the damage you have done. 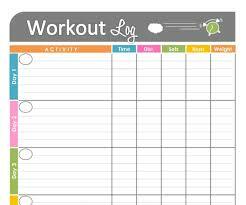 You will need to slowly increase your calories, slowly incorporate more food and more substance to your diet. Stop spending 2 hours on the treadmill a day. You have to change your whole ways, but once you have, you will actually start seeing results-you will eat more and actually lose weight. You will be able to eat more and see changes because your metabolism will be working the way it should. 1200 calories a day is not meant for a person who is active, it’s hardly enough for a person who just lays around all day, so why is this a number we see too often as a ‘daily goal’ all over the place? Because someone who did not do their own research, someone who does not care about their own health nor the health of the other people they are influencing, someone who simply picked a number at random and thought it was a good idea. Quit with the 1000 or 1200 calories a day. If you go under 1500, you are probably not seeing results if you are wanting to actually have muscle and not simply be ‘skinny fat’. 1500 calories a day. That’s still not that much. I eat 2000 a day, I work out almost every single day of the week if you include the fact that I work at two gyms (an adult gym and also as a cheerleading coach). 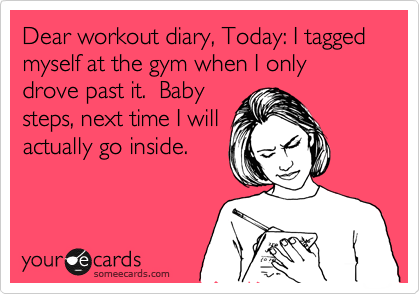 I lift weights five or more days a week. I hardly every do cardio (2-3 days a week maybe, and it’s HITT only for 15-20 minutes at a time). I eat what I want. I mainly want good foods, so I eat them. I eat when I am hungry. I stop when I am full. I even eat Reeses Oreos occasionally, as well homemade peanut butter cups (pretty much I have lots of peanut butter daily). Once you feed your body and get your metabolism doing what it is actually supposed to do, you no longer have to be so strict with what you eat (unless you are on contest prep or something). So please, for the love of everything delicious, stop with the 1000 calorie days and start healing-and nurturing-your body. So I got home yesterday from my vacation and lounging on the beach to a problem. A big problem. Our fridge/feezer some how opened itself and was hanging wide open. All of the food I had unfortunately bought prior to the trip was now ruined. I had tried to get frozen stuff so when we got back I wouldn’t have to worry about going to the store for like a week. And then this happened. Oh well. I had to replace everything. I could have cried. But I put my big girl pants on and got up this morning to go to the store (or stores). It might be a pain, but it’s the best strategy if you can possibly do it. If you live in a more rural area this might not be an option. 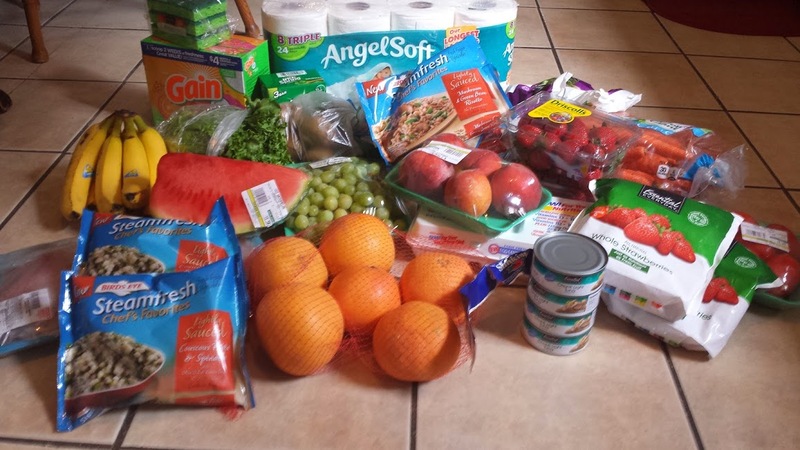 But if you can try different stores, it’s the best way to save money on certain things. Once you get the hang of this and have gone to the stores near you, you will know what you can get where (where the best prices are). I went to a store that is off the grid pretty much first. Around Atlanta, there’s this chain of stores that are kinda, well, rough. But cheap. And I can get local produce for the cheapest out of anywhere. Even back where I grew up there is a store similar to this, local produce, cheap prices. Local produce is the way to go when it comes to your fresh fruit and vegetables. Especially if you want to save money. 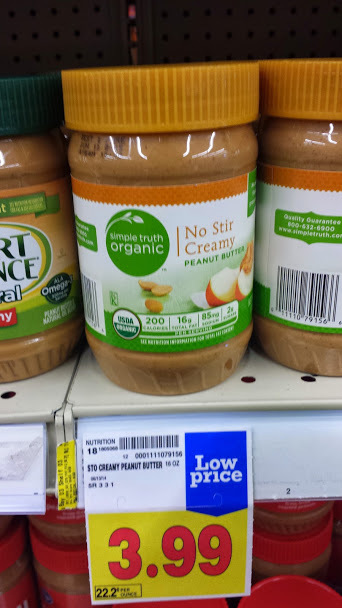 Organic is great, but it’s not the cheapest. Local supports your local farmers and economy and you can feel better about eating produce rather than that lab made produce you find like at WalMart. Gross. Bite into a standard apple at WalMart then bite into a locally grown apple. I will let you be the judge. 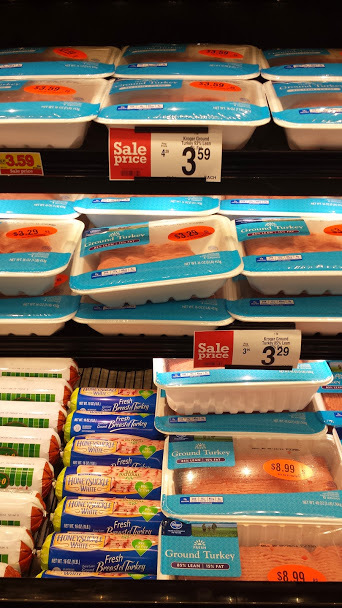 If you can’t find local produce, the next option would be frozen. Frozen produce is harvested at their peak and as long as you make sure the frozen fruit doesn’t have added sugar, frozen produce is usually pretty cheap for a good bit (store brands can be $1 a bag!). 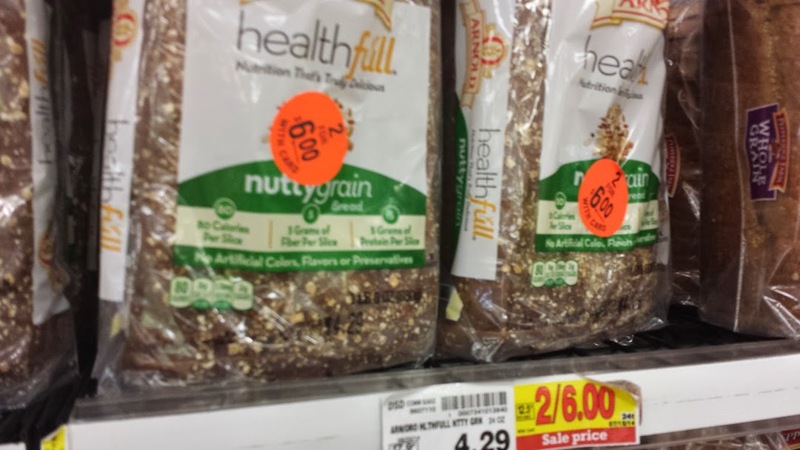 There is always a cheap option for healthier foods. You just have to look and think outside the box. I also got the non-fitness/health related stuff like the toilet paper, detergent, sponges and soap. 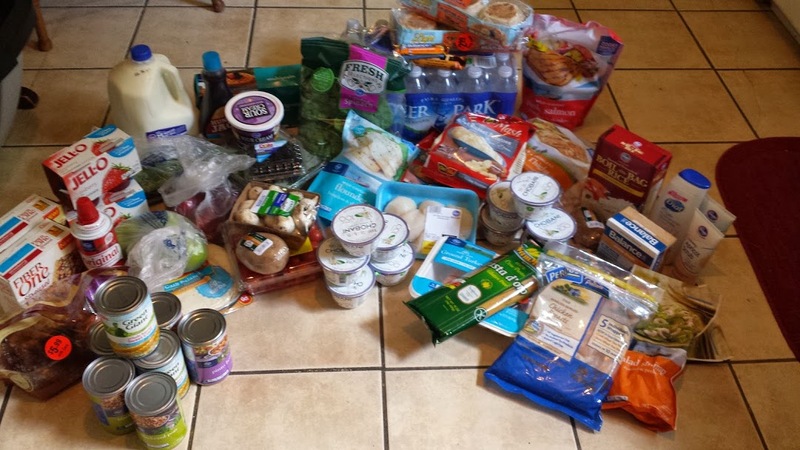 After the first store trip I moved on to Kroger. 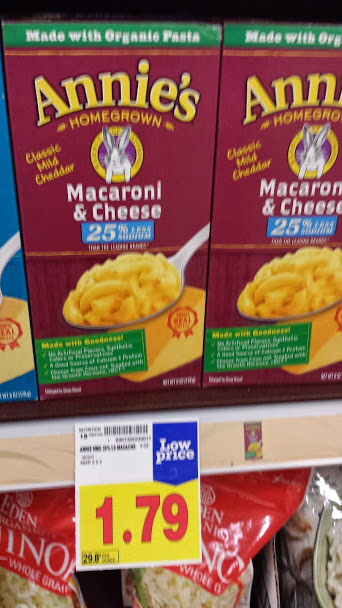 While at Kroger, I took note of items that are great choices for those on a budget, even if I didn’t get it myself this time. 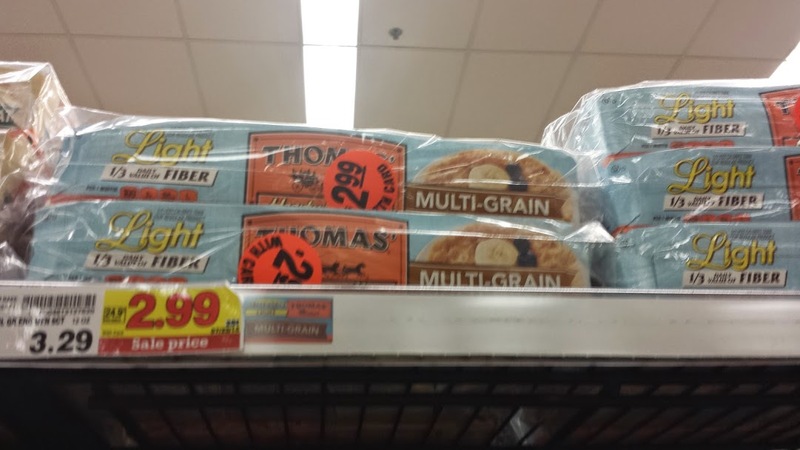 Bread wise, there are a few good options I would suggest for budget friendly shopping. 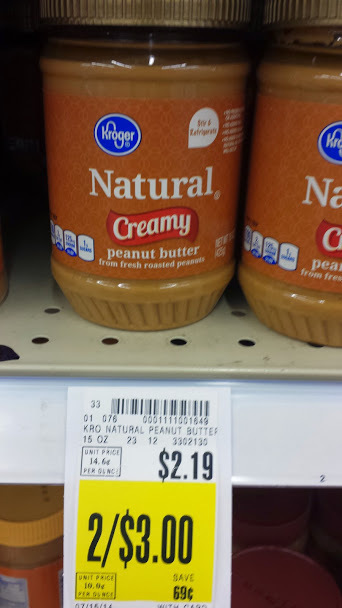 There are always good deals going on at Kroger, you just have to go and see what deals are going on. 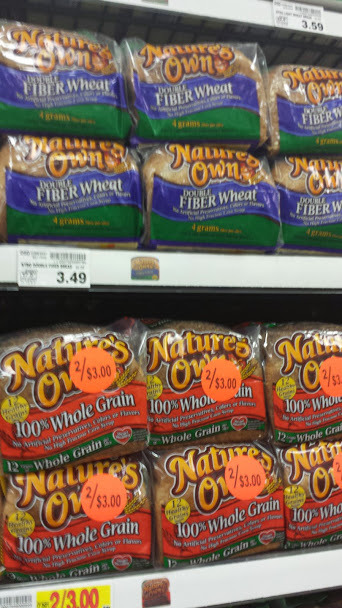 Always try to stick with whole wheat, whole grain, or multi grain bread. 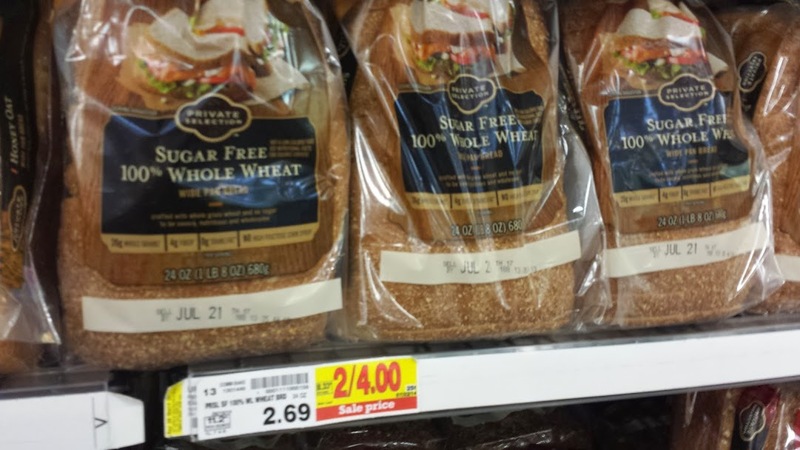 The sugar free whole wheat is a great option. I also love those light english muffins, which were on sale so I went ahead and got two packs to last a while (I usually eat at least 1 a day). Peanut butter is a great staple of a healthy/fitness lifestyle. Good macros for the macro counters. 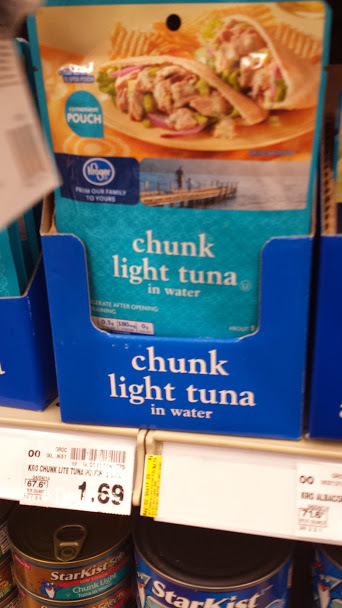 Here are two good options from Kroger. 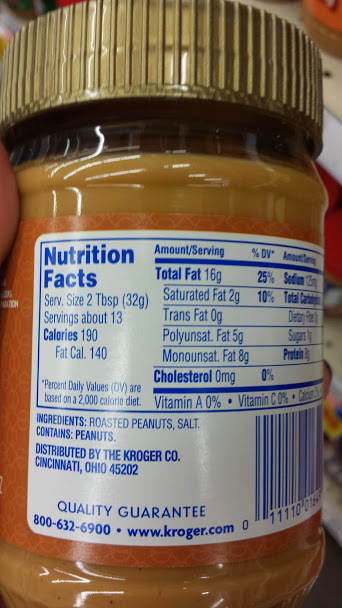 The best ingredient wise is the bottom one, with only peanuts and salt in the ingredients. Some of us aren’t a huge peanut fan and can’t handle it (like msyelf). So then you move on to the next option, the top picture. 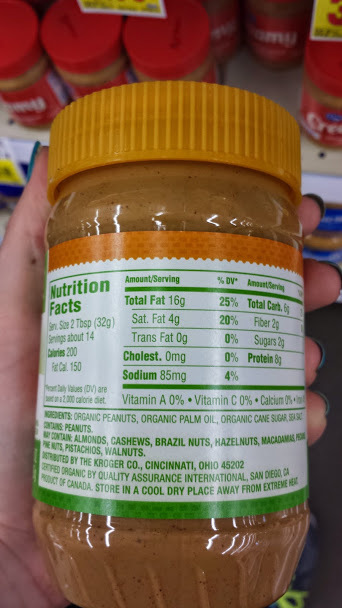 Longer ingredient list, but all natural ingredients and since I won’t be eating the peanut butter jar in a day, having this in moderation is fine. 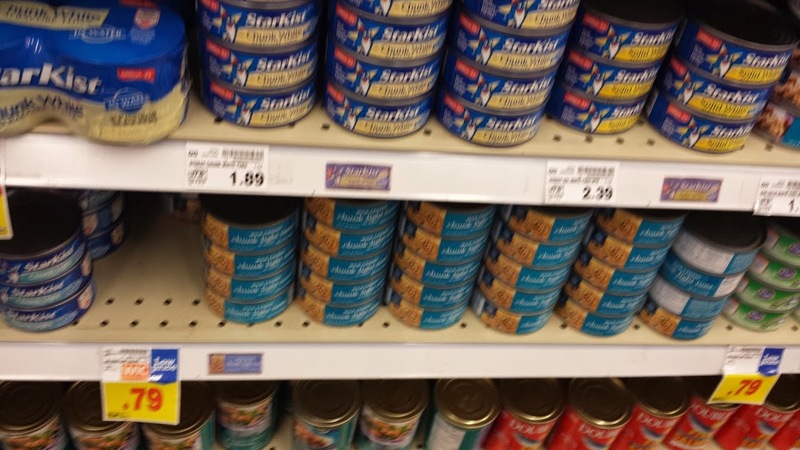 Tuna is always a great way to up that protein without any fat or hardly any carbs. 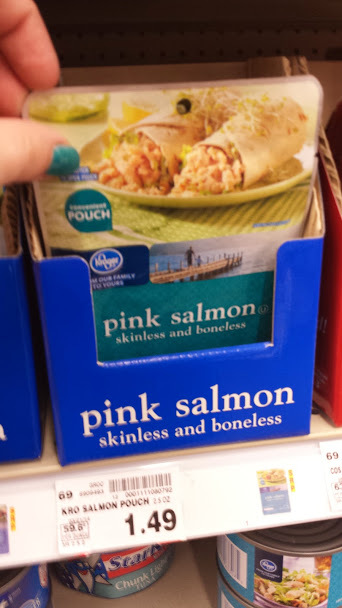 If you also like salmon, Kroger has got you covered. If you are really pinching pennies, go for those 79 cent cans. If you have a little more room money wise, the packs are great for on the go since you just rip the pack and eat out of it. I would suggest investing in a $20/$30 filter for your kitchen sink, but if you live in a dorm or some other issues, it may not be an option. So this is how you can afford to have clean water daily. 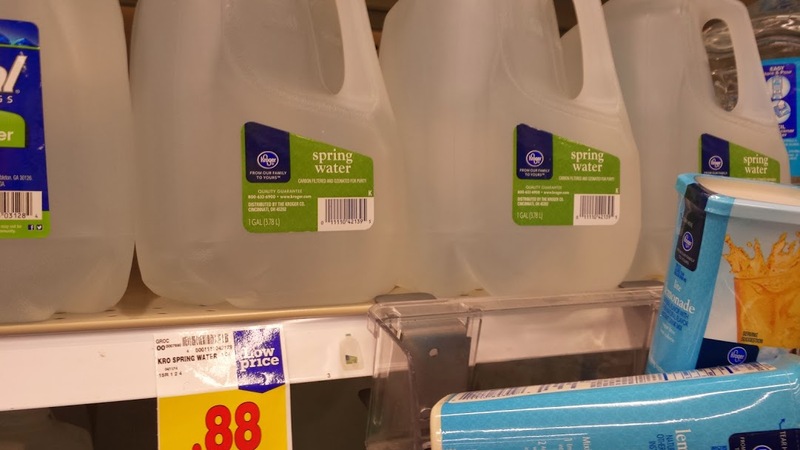 88 cent gallons of spring water is where it’s at. 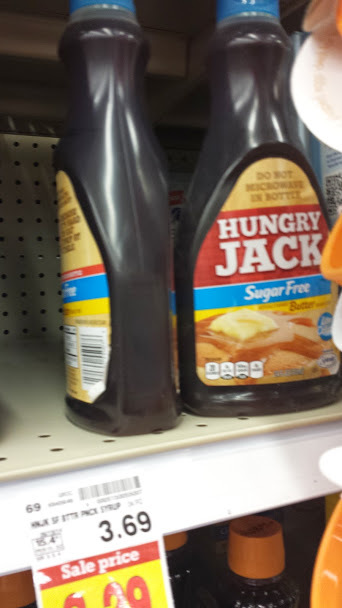 You can drink from the jug or simply use them to refill your favorite bottle. So you still want pasta. 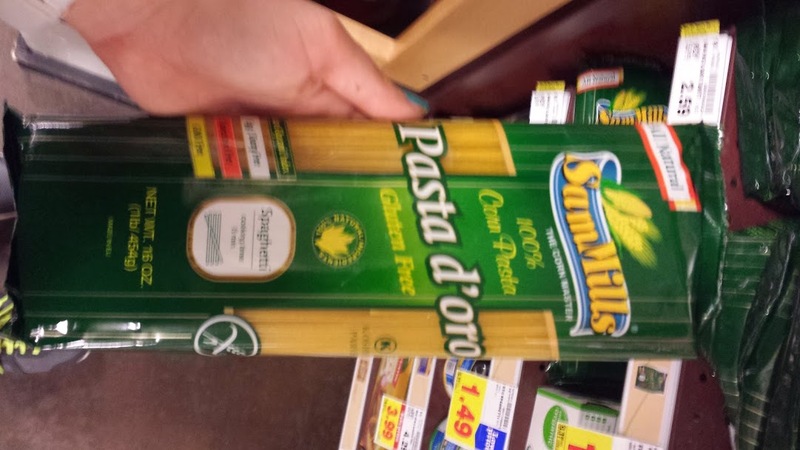 Here are good options for your pasta cravings that can fit your macros/diet. First, Annie’s is a well known brand for being organic and a lot of gluten free options. This is the reduced sodium I have shown, because I know some of you may have heart/blood pressure problems. This is a good way to still enjoy the foods you love (in moderation). Then we have my favorite pasta for spaghetti. Corn pasta! It was less than $3. So good with a great garlic tomato sauce. Love tacos? Burgers? How about meatballs for spaghetti with the corn pasta? Ground turkey is a great lean and less greasy way to enjoy those foods you love. If you are part of the macro counting life (yes, it’s possible), here is your message from heaven. 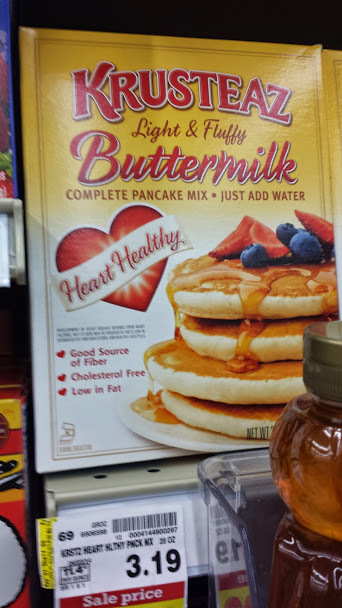 Heart healthy pancake mix (or try to look for a whole wheat/multi grain one) and lite or sugar free syrup. I bought the frozen multi grain waffles this go around as I already have this mix. Looking for something sweet? Hellooooooo sweet treat with super great macros. 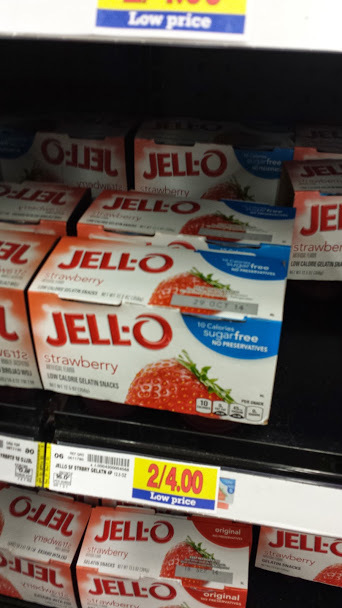 10 calories sugar free jello! Add fresh fruit and whipped cream and tada. 2 for $4 can’t beat it. 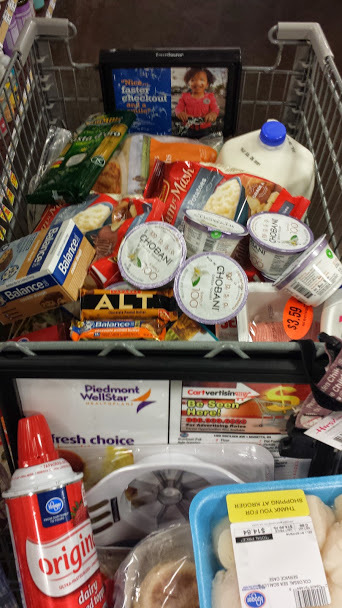 This was my cart. A little over $150 was the damage for all of this. Remember, I had to replace my fridge and freezer foods. So for two people, this wasn’t that bad. I probably can live off of this with my guy for at least 2 weeks. That is a savings of $445! And my non health/fitness stuff like lotion, face wash, etc. 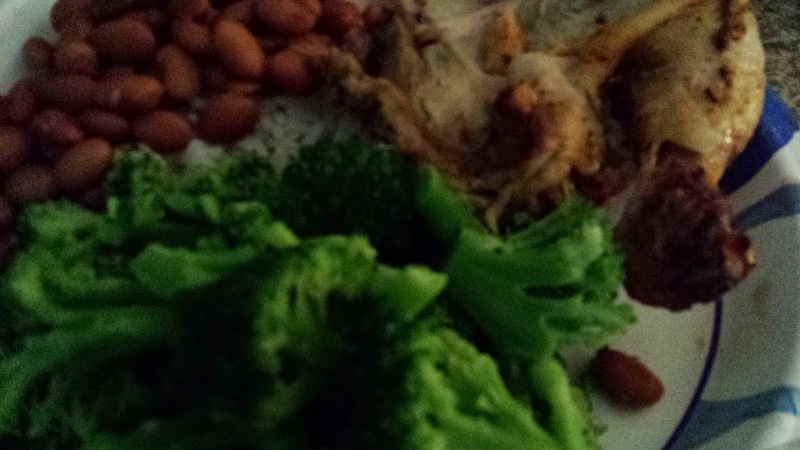 For dinner, we had the rotisserie chicken, rice, pinto beans and broccoli. Super quick, easy, delicious and budget friendly! I will keep posting how I use these items I bought to help you out!